Stephen Ponting was born in 1948, while his father was in the military. During Stephen�s youth, his family traveled to different military bases whenever his father was transferred. Stephen spent 1953 through 1955 in Germany living with his family in Frankfurt and then in Bad Kissinger. In 1962, Stephen attended ninth grade in Los Angeles, Calif. at the Queen of Angels High School Seminary. He went to George Washington High in San Francisco in 1963 for his tenth grade year. He attended Elk Grove High in Sacramento, CA for his eleventh grade. Then he attended twelfth grade and graduated from Orange High in Orange, Ca in 1966. In 1966, He traveled to Cocoa Beach, Florida for the summer. Upon returning, he entered the U.S. Army in September of 1967. He spent 1968 and '69 in South East Asia serving time in Viet Nam, enjoying the many sites and sounds of the '68 and '69 TET Offensive fulfilling his volunteered duty for Uncle Sam. Stephen�s first encounter with the martial arts was in 1963 in San Francisco, CA from a young Chinese friend that he attended school with, he was taught only blocking and defensive moves, reminded by his friend that at that time only Chinese could teach Chinese offensive moves. His next encounter was in 1964 in Sacramento, CA from another Asian friend who taught him privately at his house, this is where Stephen first encountered the theory that the best defense is offense. Enjoying the superior moves that the martial arts offered as opposed to the moves he learned in boxing classes taught at his school as part of PE programs, Stephen continued to seek out anyone who could show him new skills. Stephen appreciated his early training in those martial art lessons, for it developed his passion for the art of empty hand fighting. 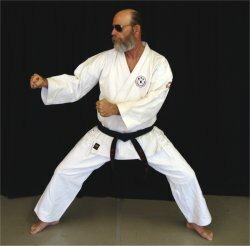 It was not until 1993, that Stephen finally found a group of individuals, who actually knew the true ability of Karate, which he had been seeking for all his life, and they were called�Yoshukai! 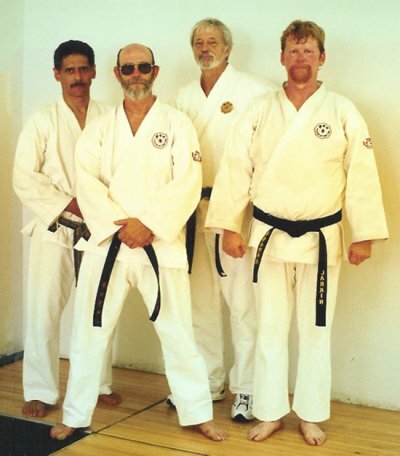 He has been a member of the Yoshukai International Karate Association since that time. He travels to Florida for Natsu Kieko every year that's possible.